Chris Hogan is a #1 national best-selling author, dynamic speaker, and financial expert. For more than a decade, Hogan has served at Ramsey Solutions, spreading a message of hope to audiences across the country as a financial coach and Ramsey Personality. In today’s episode of the Money & Media podcast sponsored by LadderLife, Chris his journey from bill collector to money coach. He also discusses the importance of having a spirit of gratitude, being a lifelong learner, and overcoming fear. 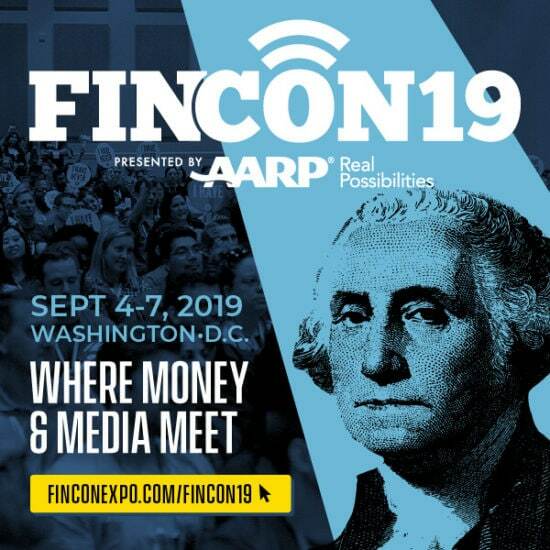 We are excited to feature Chris as a #FinCon18 keynote speaker at this year’s event. Hear more of his story as well as a bonus interview with Harlan Landes about this year’s Plutus Awards all in one incredible episode. Many of our listeners probably know at least a little bit about Chris Hogan but how many of you know where he came from? He didn’t just become a Dave Ramsey personality one day. From the age of 12, Chris actually had the ultimate goal of joining the FBI. When he completed his Master’s degree program, he dove into what he needed to do to make this dream come true. And to his surprise, it seemed that the more he worked, the more the door on that career dream closed. Even though this had been his dream since 7th grade, he had never really sat down and counted the cost. Long hours and days away from family and not being able to tell his family where he was or what he was doing just didn’t sit well with him. Eventually, he found himself working at a finance company. He likes to say, “At the beginning of the month, I was lending money. At the end of the month, I was collecting it.” And a lot of that collecting was done door-to-door. Chris says this is when he got his ​Ph.D. in people and in reality​. Because it’s one thing to talk to people on the phone and try to collect money. It’s another thing entirely to knock on a door and actually come face-to-face with their reality. He began to develop a heart for people and a desire to help them. He was very much interested in the money side of his work but equally interested in the heart of the people he was serving. This led to a career in the banking industry, where he focused on mortgages and eventually ended up in the investing and personal finance world. Chris Hogan was in for an eye-opening experience once he got into the mortgage banking side of things. He left consumer finance and their “lend to everyone and expect them to pay it back no matter what” attitude only to deal with the exact same thing in a more professional setting. Mortgage bankers may wear a suit and tie, but they still lend money to anyone who qualifies without regard for what may be going on in those people’s lives and their ability to repay the money. After some time in this new venture, Chris was again feeling burned out. That’s when he happened to meet Dave Ramsey at a charity event. Initially, Chris had very little knowledge of who Dave was, except to know that this Ramsey dude was cutting in on Chris’s business, telling people to stop borrowing money. Chris was intrigued enough to do some investigating and what he learned was that he firmly believed in the message Dave was putting out. Later, Chris had the opportunity to sit in on one of Dave’s radio shows. What he saw when Dave was off the air was something he wasn’t expecting. Dave was spending commercial breaks helping people who called in find the resources they needed to get out of financial trouble. What Chris saw was someone who had a heart for the people combined with the knowledge of how money works. He didn’t walk into Ramsey Solutions one day and get offered a podcast, book deals, and a speaking gig. Chris Hogan actually began in the company by working with professional athletes, entertainers, and musicians on a new wealth program the company was testing out. Essentially, he was teaching these folks how to deal with their money. The program wasn’t as successful as Chris wanted, mostly because of the agents these people had; agents that didn’t want them being careful with their cash. It was a disappointment to Chris, but he continued coaching high-end business people. He also began coaching middle and lower income people as well. Care about your topic. You need to be speaking on something that you are passionate about. Care about your audience. Those are real people with real lives sitting there listening to you. Do you care what their lives are really like? You don’t know what they came in from so be sure they leave with something substantial. Have something to say. Deliver a memorable message infused with humor and stories. Be authentic. It’s a whole lot easier to stay in character if you are being your true self. Chris Hogan has come a long way since the days of knocking on doors at the end of the month to collect money. What hasn’t changed is his heart for people. Chris had a few things going for him when it came to starting a podcast. For one, how about that voice? Seriously, if you aren’t familiar with his voice, stop right now and go listen to this episode or at least part of it. So, the gift of a memorable voice combined with his love of communication were obvious signs toward a podcast. But it was also his desire to teach and help the average person learn about money that came into play. Simply put, they don’t just do things the way they’ve always been done; there should be a thinking process behind everything. How can it be tweaked? What kind of improvements can be made? What should we start and what should we stop? The key when thinking like a scientist is figuring out what to change while still remaining authentic to the thing you are trying to accomplish. While Chris Hogan is completely comfortable speaking and teaching, writing didn’t come quite as easily. The trouble comes in always going back to what it is you’re trying to say. It may be easy to get a whole bunch of words down, but what isn’t so easy is going back and refining that message. The process involves finding the most important part is and getting across exactly what you want to say. Then you have to drill down to the best way to get that message across. Chris actually begins with a full outline. After the outline is complete, he goes into each of those larger points and comes up with stories, stats, and other things to flesh out the message of the larger point. While writing a book, it is necessary to say no to other things. Chris says people always to want to say, “And.” They want to do this “AND” that. They want to have their cake “AND” eat it, too. And in all honesty, you can probably do things that way for a while. But eventually, you will burn yourself out. Having deadlines and milestones along the way of writing a book was a must for Chris to keep himself on track and to know when he was getting too busy with too many things at once. Hear from over 200 speakers, like Chris Hogan, at FinCon18 September 26-29 in Orlando, Florida. Register for your pass today!